Re: Exiled Kingdoms -Android RPG- Now with video! If you stil keep the old phone, you can export backup, then send the file to the other phone and import backup! I deleted the app from it to get some space back. I didn't think about the save games at that time. I guess deleting the app will delete the saves as well? Does this mean I can save just before entering a dungeon (for example) and if I get killed I can just reload the save and try again? -You don't choose slot, each game you play is always saved in the same slot, so you'l overwrite the previous save. -There can't be enemies nearby. -You can't be very low on hitpoints. The first one is there because I want this to be a choices&consequences game, mainly in the dialogues. I want people to make meaningful choices in conversations. The second and third are a consequence of that. If you save your game in a situation of unavoidable death, you'd effectively lose your game. Good, I like that you're making sure actions have consequences. I think the game play would be ruined by a too forgiving save-load methodology. Yeah, and not only because I want it to be "hard" (which I do), I want to make it replayable too. Currently I am creating dialogues and quests related to the companions. Adaon sure can bring you a lot of trouble (or sometimes be really helpful) while Grissenda is a bit more neutral. I've expanded the dialogue system, it now allows conversations with more than one people, so your companions may have things to say in certain quests and scenes. I expect to have all that finished in a week, and then dedicate a couple weeks exclusively to create new content before releasing a public Beta. Here we go. Game engine is 99% on Beta now, so for the next weeks, focusing on content. Finally! I would advise you to wait for a few days. I am rewriting a lot of the initial quests and replacing items, etc. By tuesday I'll release 0.5.836, which should be a good one to start from the beginning. Something strange has happened. In general the loading screens for new map areas are longer. But more than that: a couple times I've had the game suddenly close out during one, no crash report pop-up or anything. This only involved crossing the border, nothing else (nothing shooting or chasing). Like having the vault, btw, and the new secret areas. It seems there was more, but I forget. Longer loading times - it is true. Working on it. Game closing: This worries me. You have a sero 8 I think, so specs are reasonable. I tried to reproduce it with dual core devices, and it didn't happen . Did it happen in a particular area? Would you mind to start a new game and checking if it still happens? There was a bug which I think you reported and others did too, when using poison on eggs. Will be fixed on next update. You can still break them with your weapon, but it is a much harder way to solve it. As always, thank you very much for the report. The game closing was a rare event, probably twice in several hours. One time was moving from desert into into the Kingsbridge map. I could start a new game I guess for the new content -- I was waiting for the signal that all was ready, I wasn't sure before. Now I remember the other thing -- I bumped into and area in the snowy part of the Norteast Sagar map (between the cave and the bandits) where I can move into the mountains of the Northern Sagar map, and around under the mountains, but not out of them except (fortunately) to go back. I'll check for that collision error, thanks. Last version introduces store&registration, but all the people here that has tested extensively an helped so much, just email me asking for a code and you'll get one. Re: Exiled Kingdoms -Android RPG- Now in open Beta, download and play! Updated first post with the new open Beta link, new trailer, and other information. Now working hard on completing content, iOS version, and later, PC port. Can a moderator please move to Showcase? Hello, as per the "featured board" rules, I dare to request this thread to be moved to Featured by one of the mods. The main requisite seems to be that it is polished and has a playerbase; time to brag a little. -Has over a thousand downloads. -Is rising quickly in the Play Store rankings. In the Roleplaying category, is listed as #393 in Top Games, and #29 in Top New Games. Thanks for considering it, whatever is the decision. Just played the game, plays well, had no crashes or bugs that I noticed. The game itself is quite difficult, but has a feel of something between Diablo and baldurs gate. Was not so much a fan of the fonts, or the font size, not sure... but that's just aesthetic, and opinion. I like how you made it a demo like that with the option to buy, something lacking in many games for mobile. Did you do the art / music yourself? Very well done regardless, better than any project I've done as of yet, so don't take the criticisms harshly. The bar of equivalent games is quite high, particularly when you consider pc games. Diablo and Baldur's Gate... yeah those are definite inspirations, but also Fallout, Morrowind, Pool of Radiance. Oh ya, I almost forgot, the art in the intro scene fit the story you were telling. Also, spoiler? I tried about 5 different ways to avoid getting robbed at the start, frustrating but clever way to start out from scratch. Well, the initial scene is kind of a tutorial and introduction... yeah, your character is a naive young adventurer, no way he'll see it coming, even if you do. After that, the game is veeeery open ended. You might just forget about the main quest and go wherever you want. I've noticed something with the newest version -- the transparency seems to have been left out of the icon, it just has a plain background. Sorry, I've been terribly busy, not very active in forums other than mine. I think I fixed the transparency several builds ago. 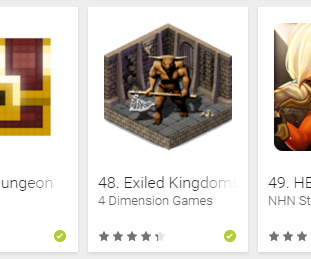 Exiled Kingdoms has reached 50K downloads and is now ranked top 50 in the United States (RPG category), and top 100 in over 20 countries. I myself can hardly believe this, after just 3 months released. Thanks everyone here that contributed to the testing!!!! I am indebted to you all. The Game looks Nice, I will try it tomorrow! I am currently looking for iOS testers (ios 8.1+, 64 bit devices). Finally! Exiled Kingdoms is available for iOS. Get it on the App Store! Unfortunately Apple doesn't allow me to generate activation codes for in-app purchases, or I'd hand out a few. But the free portion is much larger than it used to be, at least 12 hours of gameplay. Thanks everyone once more, without JGO this game wouldn't have been possible.